[New York Post] Which star won’t leave the house without $12,000 of hair and makeup, even though she’s broke? [Optional] Women only: Approximately how much money do you spend on hair and makeup in a year? My first thought as well! According to Ulta and Sephora, I spent $1740 at those two stores combined last year, but that includes haircuts and acne facials and acne treatment products for my son as well as my own haircuts and a few small gifts for nieces. I also spent about $200 in France on face cream, eye cream and perfume. “I”? Tori is that you?! 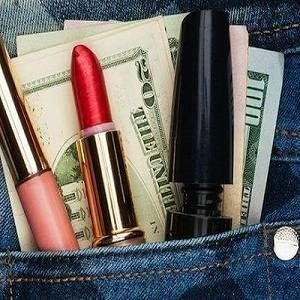 no, Ace asked women to say what they spent last year. The best I could do is say what I spend with my son. idk, this makes me think of heidi montag, even though i don’t believe she’s a “star.” as far as how much i spend on hair/makeup per year: not much; probably less than $150. This MUST be Heidi Montag. No clue on the star. It could be any of them, really. I probably spend less than $100 a year. I literally could not care less about hair and makeup, and my husband hates it when I get “fussy” as he puts it anyway. Since he and I are both happy, why would I bother? Use Suave shampoo and conditioner. It works as well as the most expensive brands. Use as little makeup as possible and save. Probably LiLohan, although she’s currently in London. Me? I wear drug store mascara and do my own hair. $12,000 ain’t worth it for that. I have no idea as to who the broke star is. But $12,000 is a lot, no wonder she is broke! I spend approximately $1,500 per year on hair cuts and color, or about $175 every 6 weeks. Shampoo and other hair care products? $300 max. Makeup, skin care, fragrance and other beauty products? $1,200 at most. Other beauty services such as manicures, pedicures, facials, waxing and threading? $1,000 if that, but probably closer to $500. So that’s $4,000 a year, which seems very generous. Optional: idk maybe $100 …I’m a natural beauty. God gave me this face and natural curls bc he knew I wouldnt spend tons of time dolling up. I know I’m lucky AF. I want to say Courtney Stodden because I just saw photos of her in the Daily Mail and she must be doing *something* each day because she looks a lot older than 21. Poor little mite. I’m 47 and you just read my mind exactly! No idea. But that is nuts. Regardless of how much money you have. Tila Tiquila. Not that she is a “star” but I could see it. @ $500 for hair and makeup in a year. Rihanna or Katy Perry unless star is referring to an actress of course. I probably spend about $300 per year. That doesn’t include hair cuts though. That would add about another $200 or slightly more. That includes facial products (lotions, etc. ), makeup, make up removers, etc. This is increased this year by the fact that I lost all of my makeup on vacation. No idea who the blind is about, but I turned 50 this year and my husband gave me a spa package that cost $2500 for 12 facials. My hair is very low maintenance, maybe $50 a year, and I don’t wear makeup, but I think that the facials will be ongoing. I would say under $100… I cut my own hair and wear mascara from Walmart. Eat lots of fruit and veggies, don’t smoke and your hair and skin will be naturally gorgeous! Not sure what you mean by $12,000.00 worth of hair. Do you mean she carries $12,000.00 worth of wighs and extensions with her in a bag or wears the wig/s on her head? Sonja Morgan of RHNYC. (Won’t leave the house is a clue?). I’m going with Tori Spelling. She’s totally out of touch with reality and grew up with a millionaire father. She doesn’t get how to budget. The reality ‘star’ who got released from prison recently? Teresa what’s her face? I used to spend lots on all kinds of beauty stuff- makeup, hair, etc. But a long road trip two years ago changed that and now I only use concealer, a little cream blush, lipgloss and mascara, and I feel prettier and more confident than before. The hair highlights are courtesy of our beautiful so cal sunshine, so those are free. Don’t know who this is, but I spend $0.00 on hair and make-up. My mom cuts my hair and I may spend $20 on lotion, but definitely nothing as excessive as $12,000. That’s just ridiculous — especially if you are broke. Not Tori Spelling. She has all those kids and her and her husband barely get by She has talked about the sacrifices and how she has had to tighten her belt after her fall from luxury. Though Lindsay Lohan is broke, she still buys expensive cosmetics. It is her.The one celebrity I actually feel for is Lindsay. With a mother and father like that it is amazing she is still alive. That sweet child form long ago and those rotten parents ! I cut my own hair, always wear it in a braided updo. I do spent about $50.00 or so a year on China Glaze and Seche nail polish and other nail care items though. I love a nice mani/pedi. Jennifer Love Hewitt. She of the bedazzled vajayjay.